In 1943, Buckminster Fuller — the famous American architect, systems theorist, author, designer, inventor, and futurist— created a new kind of global map. The Dymaxion map, as it would eventually be named, was patented in 1946 and has undergone numerous modifications ever since. 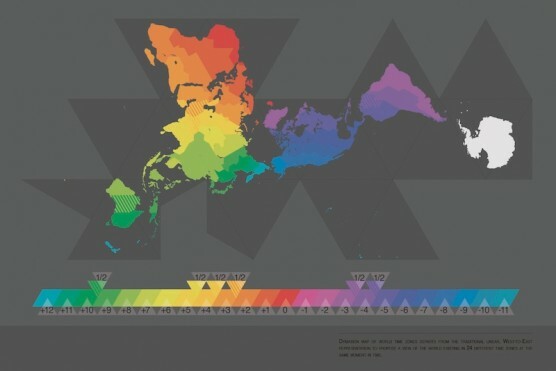 The Dymaxion map is distinguished by its unique shape. It is created by projecting a world map onto an icosahedron, which can be unfolded and flattened into two dimensions. With such a shape, the Earth’s land appears to be nearly contiguous. Reduced distortion compared to other maps, including the Mercator projection and the Gall-Peters projection. Does not have a “right way up,” which, according to Fuller, reflects the lack of such “up/North” and “down/South” direction in the universe. Emphasizes the high percentage of ocean relative to land mass, as well as the interconnectedness of the continents. Can be displayed as either a 3D globe or 2D map. Now, seventy years after its invention, the Buckminster Fuller Institute has organized a competition challenging graphic designers, visual artists, and citizen cartographers to create a new and inspiring interpretation of the Dymaxion Map. The competition is dubbed “Dymax Redux” and will announce its winner in the Fall of 2013. The 11 finalists have been announced and their entries are on display on the Buckminster Fuller Institute website. You can view their work here.